This long sleeve suntop is perfect for having fun in the pool or at the beach whilst staying protected from the sun. Made from Endurance, an exclusive Speedo fabric designed to last longer, it is 100% chlorine-resistant to prevent snagging and fading 20 times longer than any other swim fabric. This fabric also features 4 way stretch technology for added softness and comfort. Our two year old always wears this on the beach. 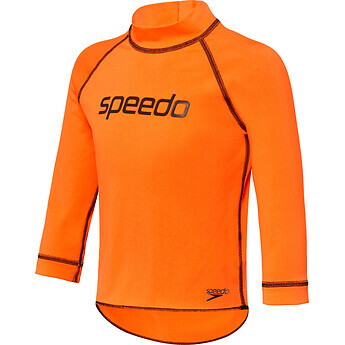 Great quality material, easy to put on with the zip at the back and he is visible from far away in that orange colour. Will get the next size up soon so we have it ready!